The meeting comes days after the US renamed its oldest and largest military command - the Pacific Command - to Indo-Pacific Command, amid heightened tensions with China over the militarisation of the South China Sea. 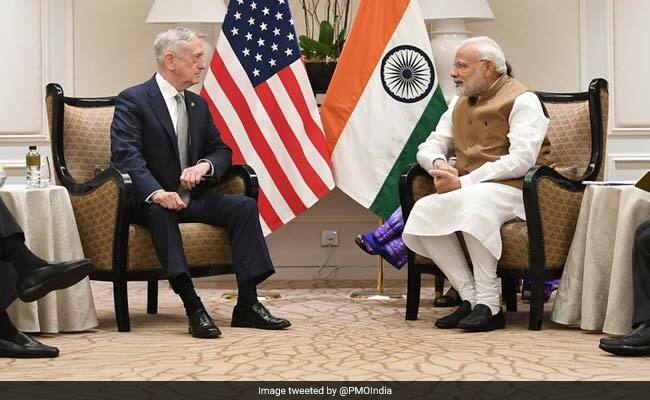 Prime Minister Narendra Modi today met US Defense Secretary James Mattis in Singapore and discussed security related issues, days after the Pentagon renamed its Pacific Command as the 'Indo-Pacific Command' in a largely symbolic move to signal India's importance to the US military. Prime Minister Modi, who is in Singapore on the last leg of his three-nation visit, held a closed-door meeting with Mr Mattis during which both sides discussed all security related issues of mutual and global interests, sources said. National Security Adviser Ajit Doval was also present in the meeting that lasted for nearly an hour. The meeting was held on the sidelines of the annual Shangri-La Dialogue which was addressed by PM Modi last night. "The focus of conversation was on the region in the context of the PM's keynote address at the #SLD18 yesterday evening," Ministry of External Affairs Spokesperson Raveesh Kumar tweeted. In his keynote address, PM Modi had said an "Asia of rivalry" will hold the region back while an Asia of cooperation will shape the current century. Asia and the world will have a better future when India and China work together with trust and confidence while being sensitive to each other's interests, the prime minister said yesterday. "We should all have equal access as a right under international law to the use of common spaces on sea and in the air that would require freedom of navigation, unimpeded commerce and peaceful settlement of disputes in accordance with international law," he had said. Mr Mattis also addressed the dialogue where he stressed upon freedom for all and "reaffirmation for rule based order". The meeting between the two leaders assumes significance as in his address Mr Mattis has stressed upon both countries working together and with other nations for ensuring peace and security in the Indo-Pacific region. "It is only appropriate that waterways remain open for all nations," Mr Mattis said. China claims almost all of the South China Sea. Vietnam, Philippines, Malaysia, Brunei and Taiwan have counter claims over the area. The US also rejects China's claims of ownership of the area. The Pentagon's move is also reflective of the growing importance of India in US strategic thinking. India was granted the 'Major Defence Partner' status by the previous Barack Obama Administration, providing for transfer of technology and deeper cooperation in the defence sector. In 2016, India and the US had signed a crucial logistics defence pact enabling their militaries to use each other's assets and bases for repair and replenishment of supplies, making joint operations more efficient. Soon after coming to power, the Trump administration had renamed Asia Pacific as Indo-Pacific and identified India as one bookend of the region.